Make sure the server you are planning to install SCCM 2012R2 to is part of the Active Directory domain (functional level 2008 or higher). The Windows Server OS should be Windows Server 2008 or higher. A Configuration Manager site system server must use a 64-bit operating system. The only exception is the distribution point site system server role which can run on 32-bit operating systems. 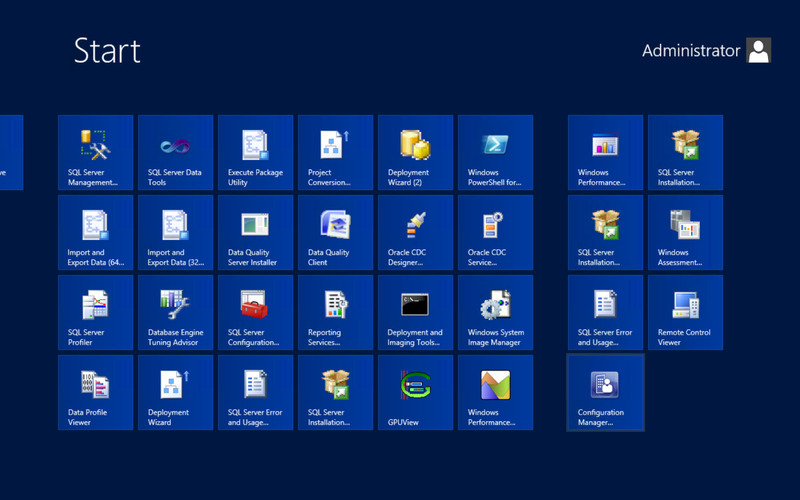 This means that the distribution point site system can run on a desktop operating system i.e. a dedicated Windows 7 Professional machine. The Windows Server needs to be installed with GUI as Site Systems are not supported under Server Core installations. You need to make sure .NET Framework 3.5 SP1 is installed even if .NET 4.5 has already been installed. The domain name of where the site system server is located cannot be renamed. You cannot change the domain membership of the server. You cannot rename the server. It is not supported on an instance of a Windows Server cluster. However, the SQL server can be part of a cluster. SCCM 2012 requires SQL Server 2008 or later versions UP to SQL Server 2012. It will not recognise later versions of SQL Server such as SQL Server 2014. You need to activate the service broker networking in the SQL server as it is required by SCCM 2012R2. 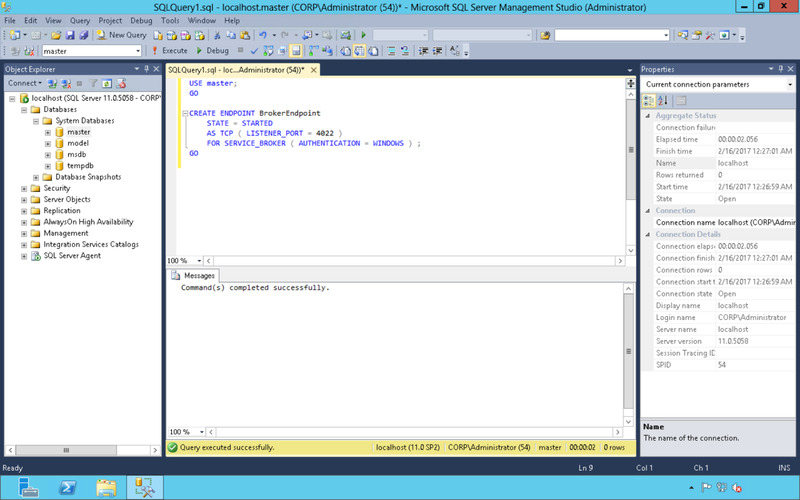 This can be done by issuing T-SQL commands in SQL Management Studio on the SQL Server. In SCCM 2012R2, a Primary Site can manage up to 100,000 devices. It is no longer necessary to install a Central Administration Site unless more than one Primary Site is to be installed. With one Primary Site supporting up to 100,000 devices, some of the reasons for creating more than one Primary Site include geographical or political constraints, or you have more than 100,000 devices to support. 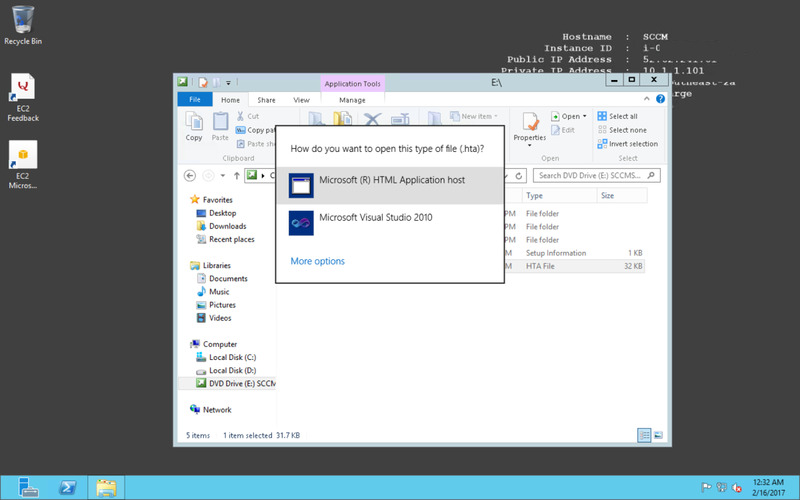 If the setup program doesn’t automatically run, you can right click the splash.hta file and select to Open with Microsoft ® HTML Application host . 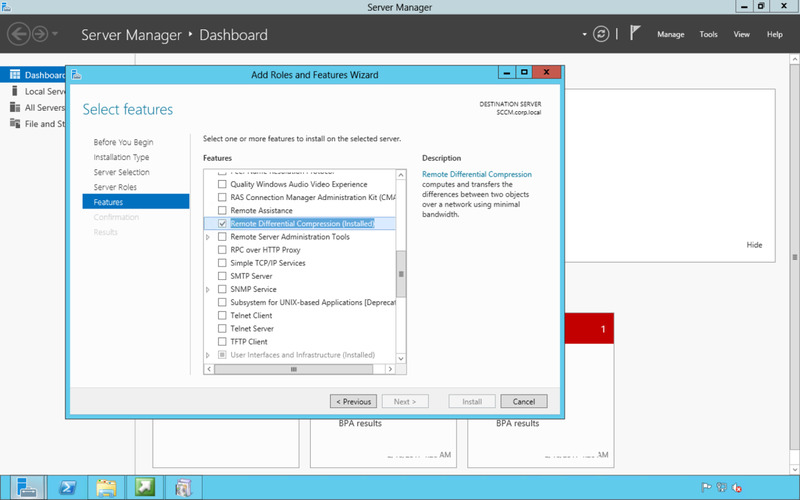 Select Install a Configuration Manager primary site, and leave the other options unticked. Then click Next. Select Install the evaluation edition of this product and click Next. Select I accept these license terms and click Next. Select I accept these License Terms for the three options and then click Next. The Setup program will download some files as part of the installation. 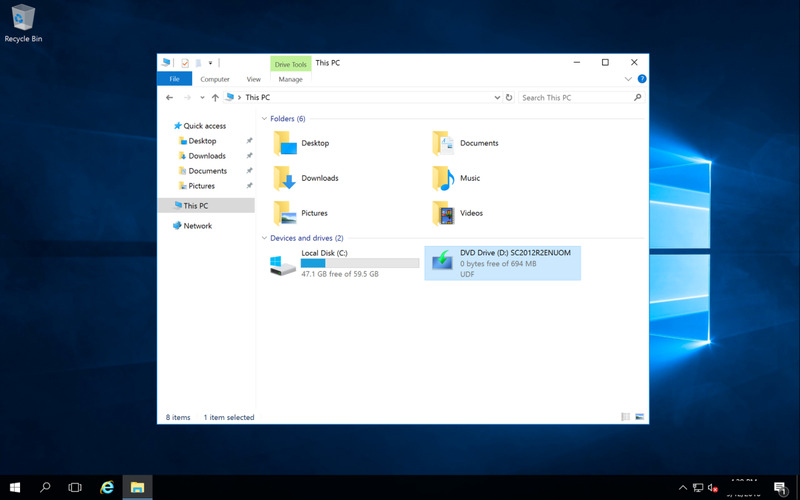 Create and select the folder where you would like the files to be downloaded to. Then select Download required files and put in the path to the created folder and hit Next. For now, let’s leave English as the Supported Language and click Next. Leave the client languages supported as English and click Next. Enter the Site Code and Site name details. Put in the path and name of the Installation folder. Select Install the Configuration Manager console and click Next. For this tutorial, we are going to keep it simple and select Install the primary site as a stand-alone site, then click Next. Click Yes to the confirmation. Enter the FQDN (Fully Qualified Domain Name) of your SQL Server. 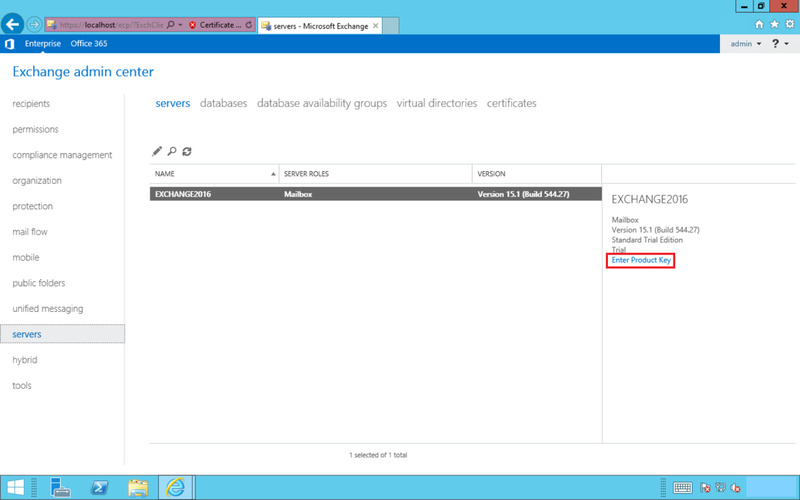 If the SQL Server instance to be used is the default, then you can leave the Instance name blank. You can leave the Database name as the default that the Setup program has generated unless your company has a naming convention for your databases. The Service Broker Port number should be the Listener Port number that was used when the Service Broker was activated using the T-SQL script. Normally it is good practise to place the SQL Log files on a separate volume to the data files. 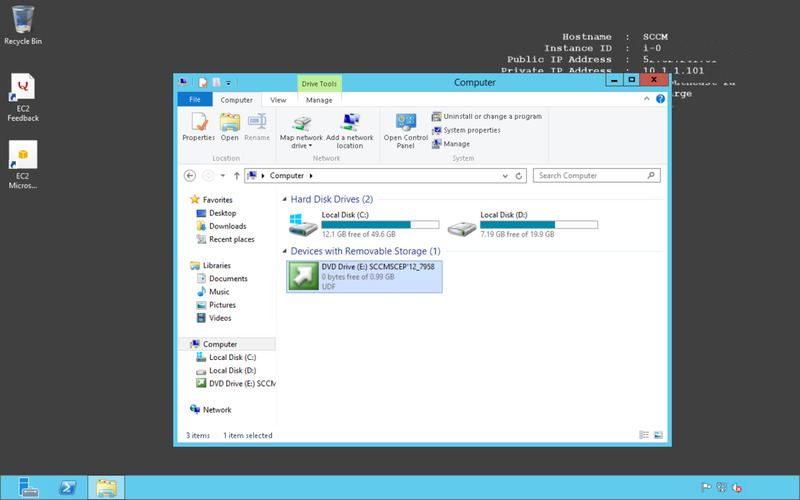 It’s also good practise to place the database files onto a separate volume to the C drive which contains the operating system and application files. However, for our tutorial, we’ll place them all on the C drive. You need to now choose the location of where to install the SMS Provider. The SMS Provider is a component of configuration manager primary sites and is used by Configuration Manager consoles to access site database information from the SQL Server hosting the site database. 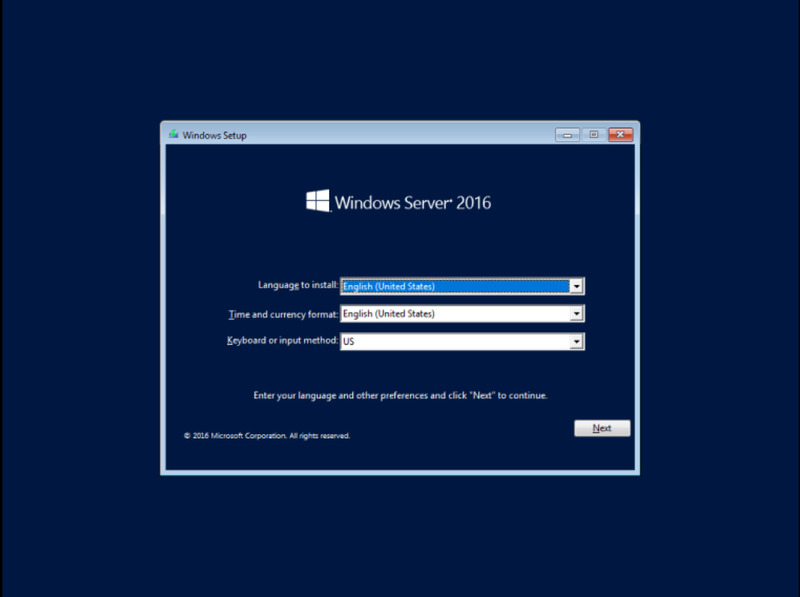 It can be installed either on the site server, SQL database server, or a totally separate server (running a server class operating system i.e. Windows 2008 or above). The pros and cons of which server to install the SMS Provider is outlined in the table in the following Microsoft link. 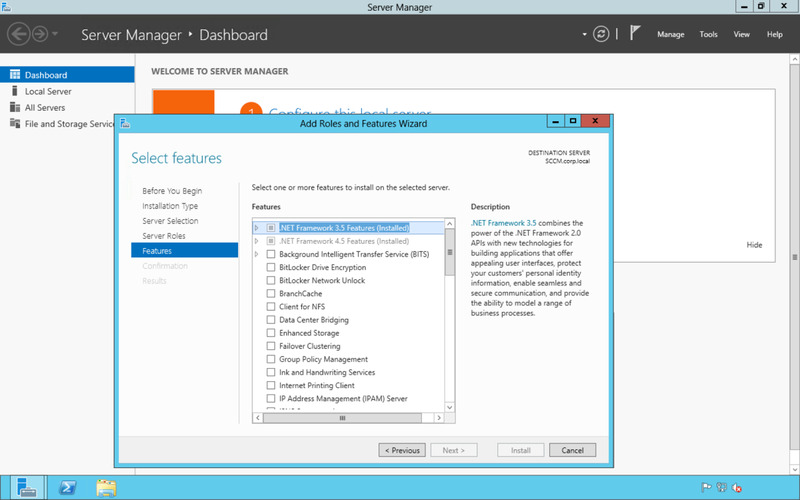 For our tutorial, since the SQL Server and the site server is located on the same “virtual” server, we will just install the SMS Provider on the same server. Select All site system roles accept only HTTPS communication from clients then click Next. VERY IMPORTANT: When making this selection, you will need to later have your Certificate Authority deploy public key infrastructure (PKI) certificates that Configuration Manager can use. 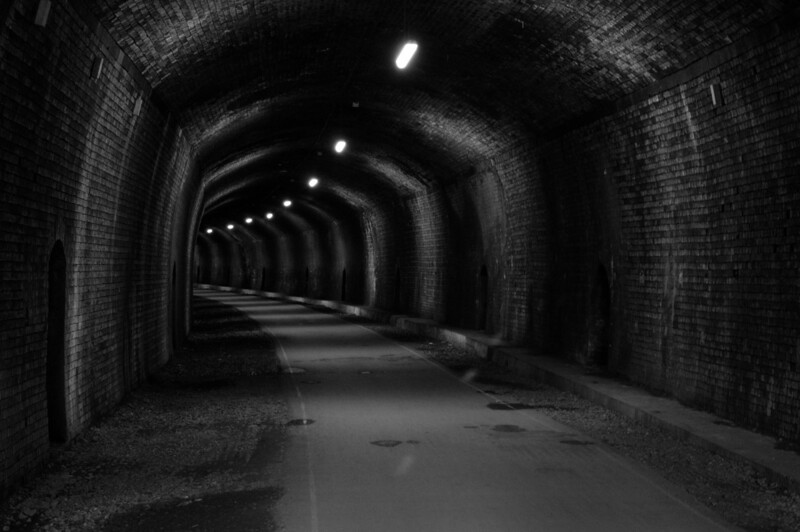 Without deploying PKI certificates, you won't be able to push out client agents to the computers on the network. We will be installing the management point and distribution point roles on the same server. It is possible to install these roles on separate servers, however, for our tutorial, we will install them on the same server as the primary site server. Select I don’t want to join the program at this time and click Next. Click Next. This will now check the pre-requisites to ensure SCCM can be installed. The Prerequisite Check will display Failed next to the required prerequisite. 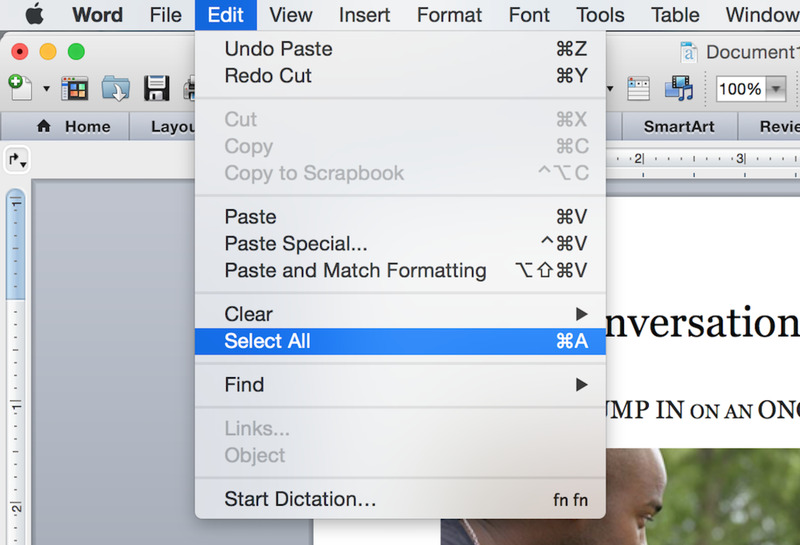 Highlighting the failed item will display the steps needed to resolve the issue. Microsoft Remote Differential Compression (RDC) library can be resolved by installing the Remote Differential Compression feature. 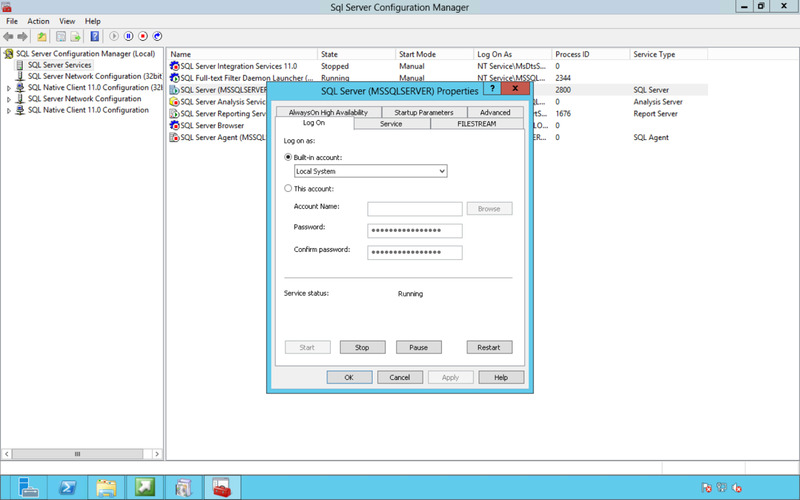 The logon account for the SQL Server service issue can be resolved by running SQL Configuration Manager and changing the SQL Server service account. The User State Migration Tool (USMT), Windows Deployment Tools, and Windows Preinstallation Environment prerequisites issues can be resolved by downloading and installing the Windows Assessment and Deployment Kit for Windows 8.1 . The following are the default options that are presented. Ensure User State Migration Tool (USMT) is also ticked. Click Install. Click on Run Check to recheck the Prerequisites. It shouldn’t come up with failed any more for any of the prerequisites. If it does, just highlight the prerequisite and go through what’s required to resolve the issue. When the check is successful (even though the status has Warning), you will be able to click on Begin Install. Click Close once the installation has finished. 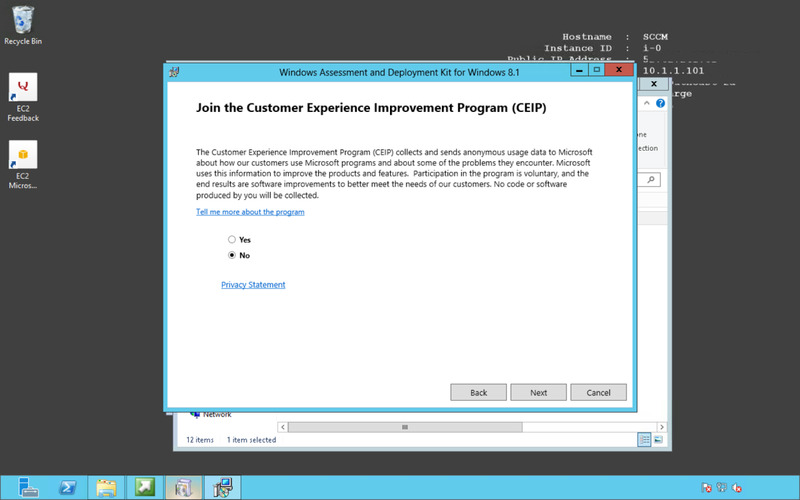 Click Exit to get out of the Setup program. 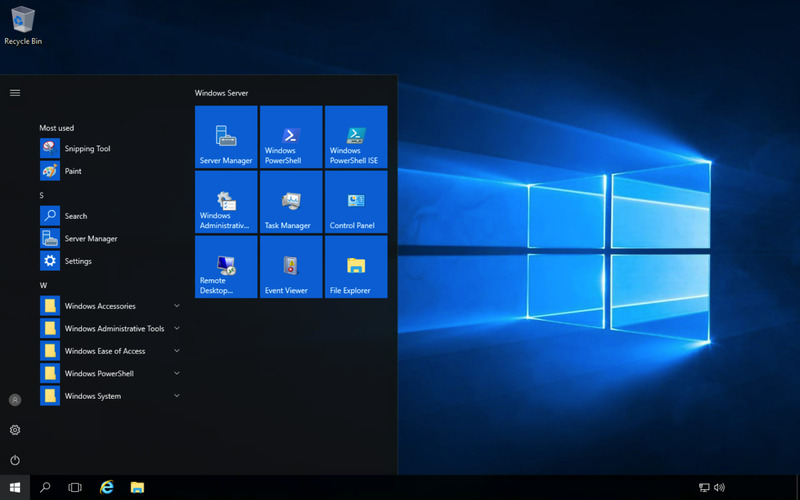 Bring up the Start menu or Apps menu depending on your version of Windows Server. Click on Configuration Manager. 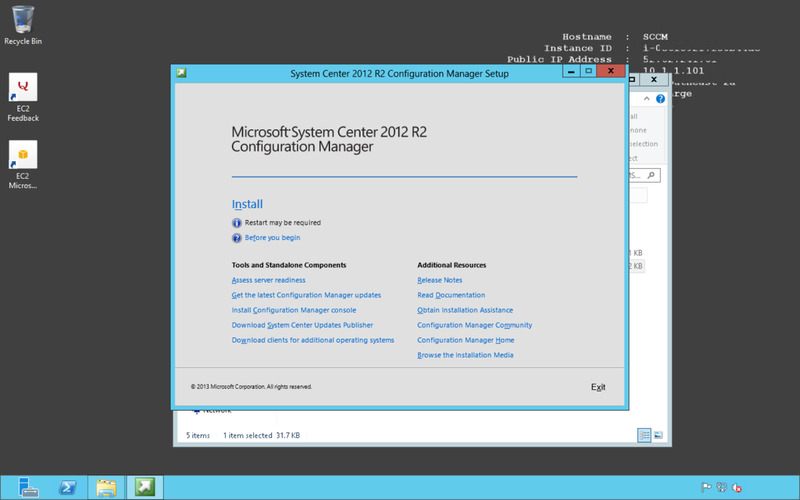 This is the SCCM 2012R2 Management Console. We have now gone through and installed SCCM 2012R2. 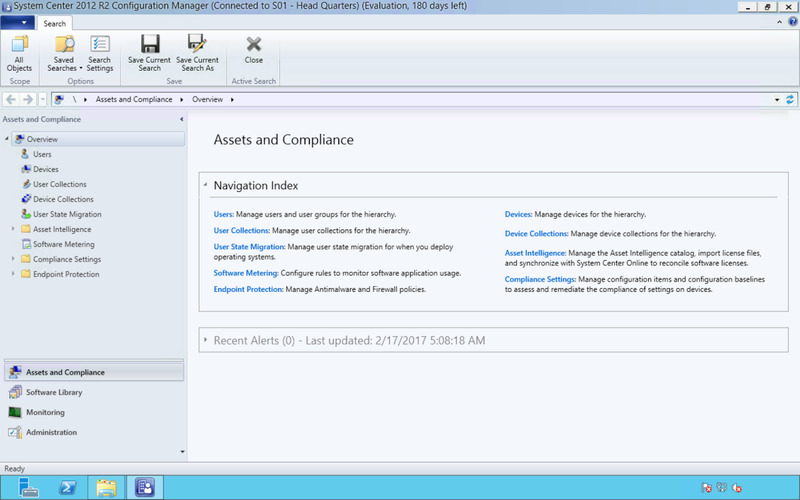 Using the SCCM Management Console, we will be able to add agents to machines that we want to manage. 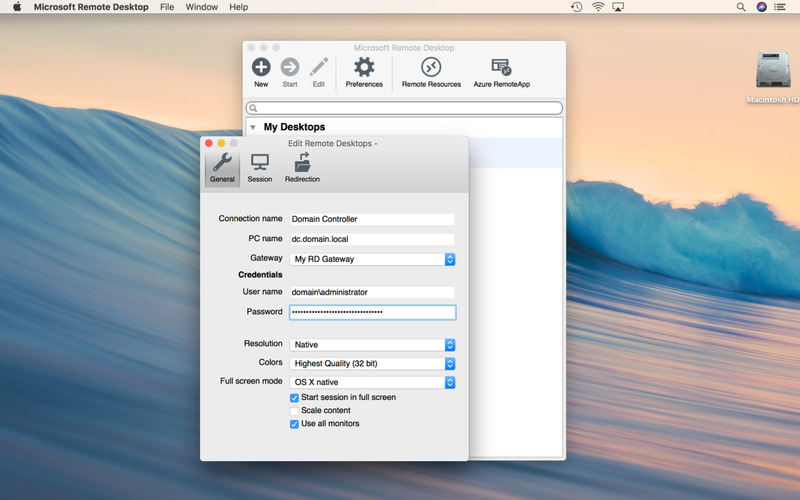 Using the console, we can also package applications to be able to deploy to those machines.